He is a member of the Grand Ole Opry since 1987 and The Country Music Hall of Fame. At 17 he had his first appearance on the Grand Ole Opry. 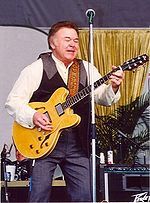 Dean who valued punctuality among musicians in his band the Texas Wildcats fired Clark for habitual tardiness telling him "you're the most talented person I've ever fired. Clark is highly regarded and renowned as a guitarist and banjo player and is also skilled in classical guitar and several other instruments. g. "Yesterday When I Was Young" and "Thank God And Greyhound") his instrumental skill has had an enormous effect on generations of bluegrass and country musicians.